Boas-Red Tail - My 6 year old girl! My 6 year old girl! 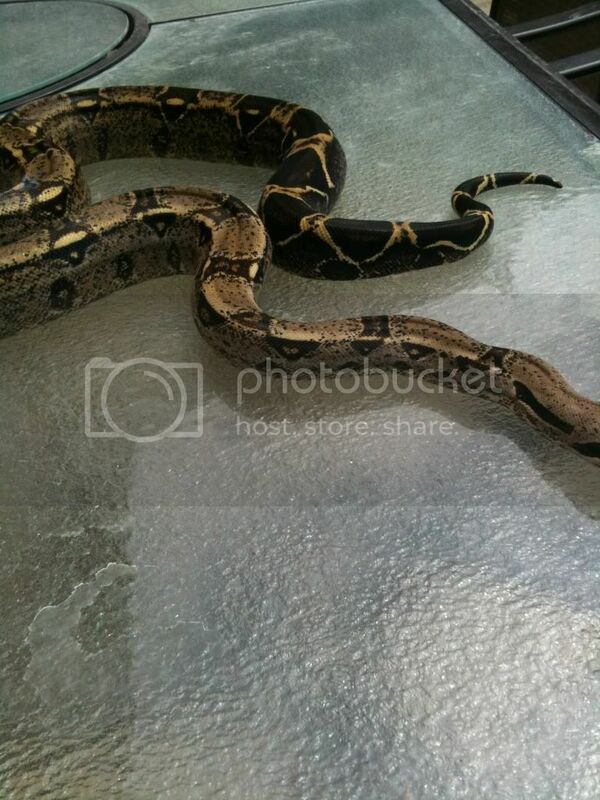 Some new pics of my 6 1/2 year old female Colombian Boa, "VIOLET". I bought her at 3 weeks old from Hamburg Reptile Show in PA. She now weighs about 20 lbs and is just over 7 foot long. She is so sweet and calm I just love her! She is stunning! I love red tail boas and I did entertain the idea of getting one, but I think they get just a bit too big for my comfort zone. She looks about the same size as my male Abberant Boa. He is almost 8ft, surprisingly large for him being 5yo. Your baby is gorgeous!! Wow, I’d love to see her reach 8 ft. It’s so funny, having her since she was a baby and handling her so much, to me she seems little, petite. To my husband, however, she is enormous. He is not the snake person and, god bless him, he tolerates my girl. When he reminds me that she is the size of my leg and, well, that definitely does put it into perspective. I will say to anyone who has a young boa, although they are naturally very docile snakes, which is why I chose the breed, the key to raising a calm, docile, well-mannered large snake is constant handling, EVERY DAY if possible, and regular, consistent feeding. Not power feeding. But I make sure that my girl is NEVER hungry. Hungry snakes tend to be grumpier and also more "curious". Buddy do you know the length and weight of yours ? And motomo, do you think that is as big as yours will get? im fairly new to colombian rt boas and also have a female and read that they can reach lengths of 12ft and 50+lbs! Beautiful job raising her all this time...splendid snake ...mine is now 7’ 6" and as yours is, a sweetheart of a girl to handle and have out about the house. Always docile...never hisses...just the nicest snake ever. I hope she gets to 8-10 feet ...wooot ! Sorry for the delay in responding. My girl just hit 8 foot this month and now 23 lbs. I would say that 8-10 foot for females is the norm. A Colombian hitting 12+ foot is not likely. Not impossible, but not likely. If you don’t want a super huge heavy weight just don’t feed huge rats more than once a week. Honestly, Colombians are docile by nature and if you handle her regularly, size should never become an issue. Good luck!